This book investigates the appropriate methodology of peacebuilding in war?torn societies, with reference to the Eastern Democratic Republic of Congo. Its objective and scope engage the role of peace education and recognition of local tensions in achieving sustainable peace and political stability in a war-ridden society. It provides a platform that could be considered prerequisite for violence eruption prevention, post?conflict reconstruction and consolidation of peace and democracy in a war?torn society. 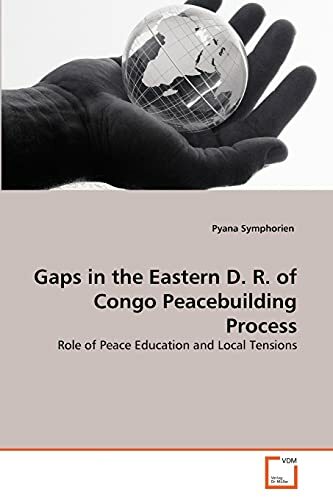 This book makes a significant contribution to the understanding of the peacebuilding process failure in Eastern Democratic Republic of Congo for the interested community of policy makers, researchers and practitioners of peacebuilding and conflict transformation. The test of its validity and relevancy is not whether it focuses on the particular context of Eastern Democratic Republic of Congo, but whether it evaluates popular peacebuiding strategies and provides a critical horizon through which one can comprehend the dynamics in the field of peacebuilding and conflict transformation at local and global contexts. is from DR Congo and holds two MA Degrees, in political philosophy from the Jesuit Faculty of Philosophy Saint Pierre Canisius (Kinshasa) and in peace studies and international relations from the Jesuit Hekima College (Nairobi-Kenya). He has published a number of articles on conflict, peace and political science.